PayPal founder and Facebook's first first investor talks about business' global responsibilities. BOSTON (TheStreet) -- Peter Thiel is best known to many as the co-founder of PayPal, which now has 98 million active financial accounts, and for being the first outside investor in Facebook, for which he is a board member and holder of what is estimated to be a 10% share in the company. In 2002, Thiel sold PayPal to eBay ( EBAY - Get Report) and founded Clarium Capital, described as "an investment management firm pursuing a global macro strategy." He is also a co-founder and managing partner of The Founders Fund, a venture capital fund. 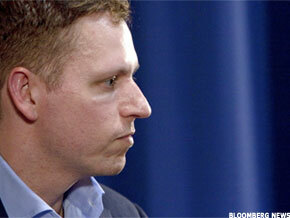 PayPal co-founder Peter Thiel has long channeled his business success into philanthropic and humanitarian efforts. Among the companies he has been involved with as an investor are LinkedIn ( LNKD, Yelp and Spotify. Thiel has long channeled his business success into philanthropic and humanitarian efforts, notably the work of the Human Rights Foundation. Last month, Thiel was a featured speaker at the foundation's Oslo Freedom Forum in Norway. The Thiel Foundation was one of the main sponsors of the event. What drew you to the work of the Human Rights Foundation, the Oslo Freedom Forum and, in general, the global fight for human rights? Thiel: The moment you notice how pervasive violence is in the world, you can never look away. Opposing violence is not only a compelling cause; it's also an intellectual challenge. For example, how do language and culture make violence easier to justify and harder to notice? Efforts to understand these problems better could make it much easier for people everywhere to tell the truth and to defend each other's rights. I support the Human Rights Foundation and the Oslo Freedom Forum because their focus on dissidents engages the intellectual debate as well as the moral cause. As we've seen this year alone, sometimes the biggest secret is how weak autocratic states are. Once the truth has been made public, it becomes very costly to deny. The dissidents at Oslo unveil the low foundations of power. You have embraced unique and creative approaches to your advocacy and charitable efforts. Why is that so important? How does this approach mirror your own business philosophy? Thiel: There are two forms of economic growth: intensive and extensive. Extensive growth is extending best practices to places where they're currently absent. Much of the catch-up growth in the developing world is extensive. For instance, bringing 20th century railroads to Asia. On the other hand, intensive growth is about creating something wholly new, going from zero to one. The first car, the first airplane, the first mobile phone. You can make the same distinction about philanthropy. The defense of human rights requires both extensive and intensive philanthropy, and I focus most of my efforts on the latter. Have recent world events -- pro-democracy movements; the continuing influence of China; even perhaps backlash to some of the invitees to the Royal wedding, made such advocacy even more relevant and vital? In the bigger picture, how is globalization helping or hurting the cause for human rights and freedoms? Thiel: There are good and bad versions of globalization, and whichever one happens, it will turn on whether we protect human rights. The existential threats that can arise in a globalized world tend to make authoritarian societies even more intolerant of dissidents and nonconformists. As all societies grow and require more innovation to overcome resource constraints, they will reach a crossroads where they must let individuals experiment and deviate from the social norm. Innovation and individuality must not become imperiled by violence shrouded in the rhetoric of emergency. What role does social media play? How important is the need to protect, and come to the aid, of bloggers who are persecuted by their government alongside more traditional journalists? Thiel: Information technology can empower governments and enable abuses, but it also helps people hold governments accountable, and sometimes overthrow them. Even the most humane governments in existence today can benefit from being held rigorously accountable to high standards. Defending bloggers is tremendously important because they offer rapid reporting and commentary about oppression and other forms of violence. The Oslo Freedom Forum has helped bring many such bloggers, including some involved with the Arab Spring, to the attention of the West. While the world once waited decades to hear the repugnant truth about the Soviet gulags, bloggers can expose such truths in minutes. Yoani Sanchez of Cuba and Kareem Amer of Egypt are two examples of people who even without billions of dollars or tanks have exposed the lies of the Cuban and Egyptian regimes. What responsibility does the business community -- and successful entrepreneurs like yourself -- have to support philanthropic and advocacy efforts? When global politics get involved, does that scare some away and, if so, how can they be convinced otherwise? Thiel: There are no sidelines in the struggle for dignity and freedom. Those who know what goes on in the world cannot sit back and expect government or some other abstract organization to handle it. The U.N. was created on the ashes of the Nazi death camps with the promise of Never Again. Yet it has happened over and over again: Cambodia, Sudan, Rwanda, Kosovo, North Korea. If we want peace in the world, individuals must accept responsibility and participate. The smart business leader knows this. It may not be all that hard to rally business leaders and entrepreneurs to offer financial support, but how can you and others encourage them to go beyond the mere opening of a checkbook? Can the disconnect that may exist between philanthropic and corporate strategy be bridged, and the two brought together more effectively? Thiel: When you recognize that a principle, like liberty, is important, you should strive to promote it in all areas of your life: your work, investments, speeches, writing and philanthropy. The more you engage, the more effective you'll become.